N.B. This symbol ✳️ means the tool is free! This is the first section for good reason! Taking the time to organise your feeds is the single most important step to using social media effectively in your reporting. Social media is incredibly overwhelming. But there are some very simple things you can do to tame it. The tips here will work best if you cover a specific beat. And the general rule is the more specific you can be the better. If you follow a lot of people on Twitter, it can very quickly get impossible to keep up. That’s where Twitter lists come in handy. Yes, it does take a bit of time to set them up, but it’s well worth doing. NOTE: you don’t have to follow a person to put them on a list. 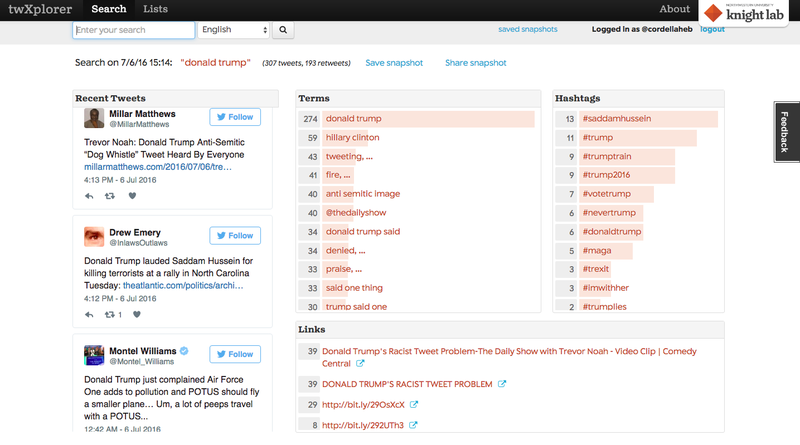 The social media news agency Storyful uses Twitter lists extensively and has its own internal “heatmap” and alert system that spots abnormally high levels of activity within specific lists. 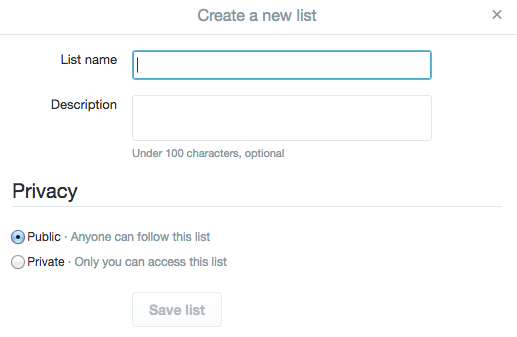 You can make your own Twitter list, follow someone else’s list/s, or copy someone’s else list and make it your own. Click the “lists” tab on the right-hand side of Twitter on desktop (note the Twitter app is not very list-friendly, so this is best done on desktop). On the right-hand side click “create new list”. Give the list a name (and, if you like, a description). You then get the option of making this list “public” or “private”. If you make the list public, when you add someone to a list they will be notified via Twitter, and your list will be visible on your Twitter profile. If you want to follow someone without them knowing, put them on a private list. This is useful if you are doing investigative work, as this example shows. Hit “save list”, then go to the profile page of the person you want to add, click the gear icon next to the follow button and select “add or remove from lists” and then select the list or lists you want to add them to. It takes time to put together a good Twitter list, and often you’ll find it much quicker to follow a list that someone else has already taken the trouble to curate. Electionista has Twitter lists for just about every country in the world, as does Tweetminster, which is particularly strong on UK politics. Reported.ly and Storyful also have lots of public lists and put together new ones very quickly to cover breaking news. To follow someone else’s list, navigate to it, then hit “subscribe”. This “ugly-but-functional” tool created by grad student Noah Liebman does the job nicely. Once armed with a few lists, you’ll want to find a way to keep an eye on them. That’s where Tweetdeck (and similar tools such as Hootsuite) come into their own. Sign into Tweetdeck (it’s free), then hit “add column” on the left. This gives you a bewildering-looking array of options. Do not be alarmed! I find the most useful lists and search. Hit “lists” and you can start to add columns of the new lists you have just created. And if you want to do a search (e.g. of a hashtag or a term or combination of terms), hit “search” add your search terms and then “add column”. Click on this filter icon, and it opens up a series of options that allow you to drill down and hone your search. Under content, you can choose to only show tweets with images, or only show tweets with video (for example). And you can also exclude retweets, or exclude specific terms that you don’t want in your search. Under users, you can opt to only see tweets from particular accounts. Update: In September 2016, Tweetdeck added a date section under the content tab, and also the option to search for tweets by location. More info on this here. The engagement section is useful. If there are too many tweets (as in the Tony Blair example above), you can opt to just see the ones which which are getting traction (click on “engagement” and then put something like 3 for the number of retweets). 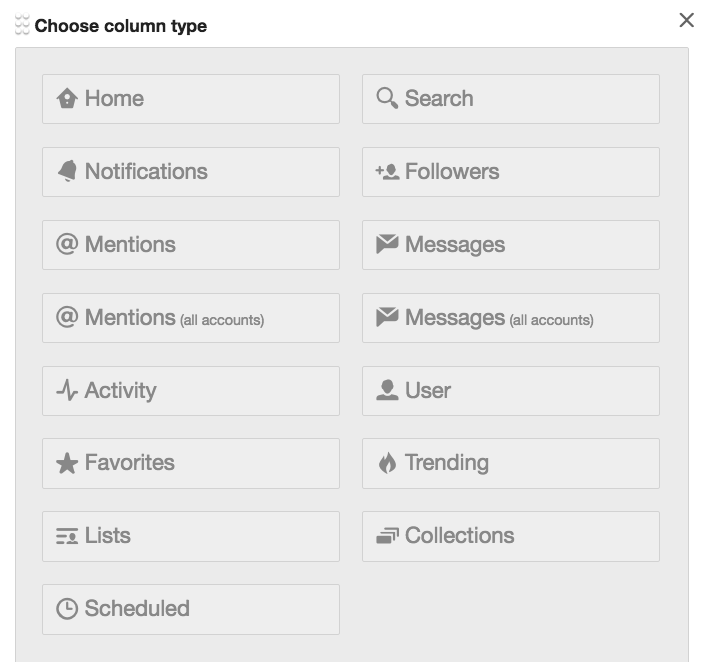 Sarah Marshall has written up some handy notes on the filter button, and there’s a great guide on using Tweetdeck columns here. There’s more on searching in Twitter and Tweetdeck in the search chapter. Update: In January 2017, CrowdTangle became free to any journalist or publisher producing “original content”. To register for an account click here. CrowdTangle is a fantastic tool. Loved by many social media managers (for the data it gives on your own posts and those of your competitors), CrowdTangle is also really useful for story discovery, thanks to a very simple concept — that of “overperforming” posts. These are drawn from the tens of thousands of Facebook pages CrowdTangle monitors. This includes every virtually every news organization in the US — big or small — as well as hundreds of lists arranged by theme (international news, health, business etc). You can also create your own lists of accounts to follow your specific area of interest/s. Based on the past history of a particular account, CrowdTangle highlights the posts that are doing substantially better than expected — and sends these direct as alerts by email. CrowdTangle started in 2011 as a tool to help connect social and political activists around the world using Facebook. It still has Facebook at its core, but also covers Twitter, Instagram and Reddit. CrowdTangle has added lots of extras, including integration with Slack, a Facebook video search, a map view (with an adjustable time-scale, and which can be filtered to see just images, Facebook live etc), and in March 2017, CrowdTangle Intelligence. This allows you to track and compare the performance (number of followers, interaction rate, number of interactions and number of posts) of your own account with that of other major ones. It is accessible via the main dashboard (on the left of the screen). Update: Tame very sadly closed down due to not being able to make it profitable as a business. It is missed! Overwhelmed by the stream of tweets on your timeline? Just want to check in from time to time to get a snapshot of what’s been going on? If so, Tame will appeal to you. 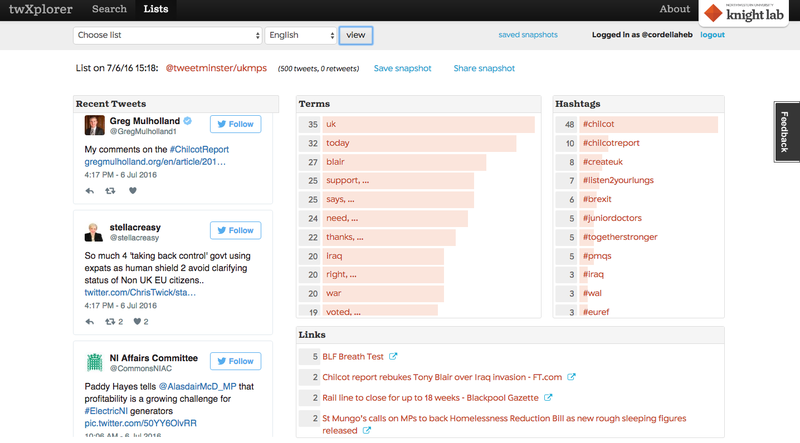 It allows you to see — at a glance — what the most shared, and most discussed stories are within your Twitter network. The timeframe is adjustable, showing anything from the last hour, to the last seven days (as in the example below). It also has an easy-to-use app and you can opt to receive ✳️ daily and/or weekly updates. twXplorer is a similar (but free) tool. It’s not as sleek a Tame, but has many of the same functionalities. Crucially, both Tame and TwXplorer allow you to analyze any of your Twitter lists, which is where it can get much more interesting journalistically. It means that without following people, you can very quickly see at a glance what’s buzzing within that circle of interest. The example below shows the most popular links, hashtags, and the accounts most-often mentioned among UK MPs within the last 24 hours. Vellum — a free tool from the NYT R&D group — does the same trick (though shows links only). A similar tool exists to monitor Canadian politicians. Politwoops shows recently deleted tweets from politicians, and covers a huge range of countries including, the UK, Ireland, France, Germany, India, Turkey, and many others — though sadly, no longer the US. Nuzzel shows you news trending among your friends and contacts. It connects to your Facebook and Twitter accounts, so if you follow a lot of people for professional reasons, your feed should get interesting. Like Tame, it’s a quick way of keeping up with the main talking points within your network, and it also has a great free app. Newsle does the opposite — alerting you to news stories about, or by, your friends and social media contacts. 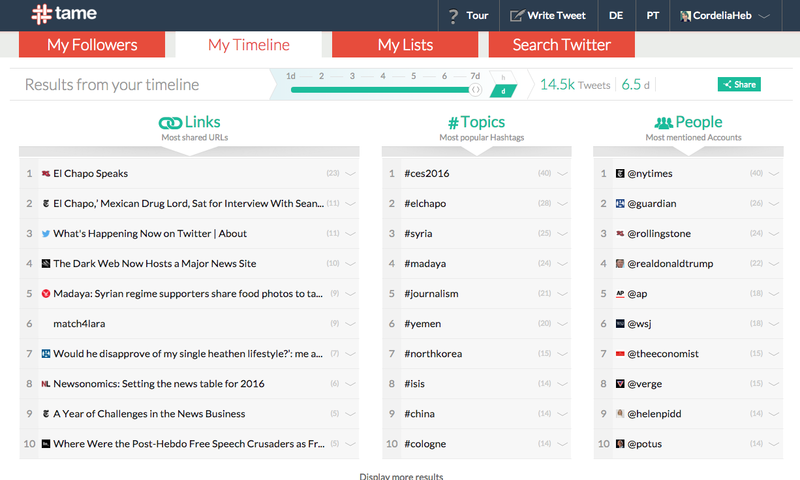 SAM is a tool to help teams search, filter, and publish social media content more easily. It’s a paid-for tool only, but is priced by size of team/organization, so if you are a smaller operation it may still be affordable. It’s like a super-charged, more user-friendly version of Tweedeck, that also pulls in content from Instagram, YouTube, Facebook and VKontakte (hugely popular in Russia and Ukraine). It was founded by James A. Neufeld, a Canadian journalist with a background in TV newsrooms, who was frustrated at having to have 10 tabs open in Chrome at a time. 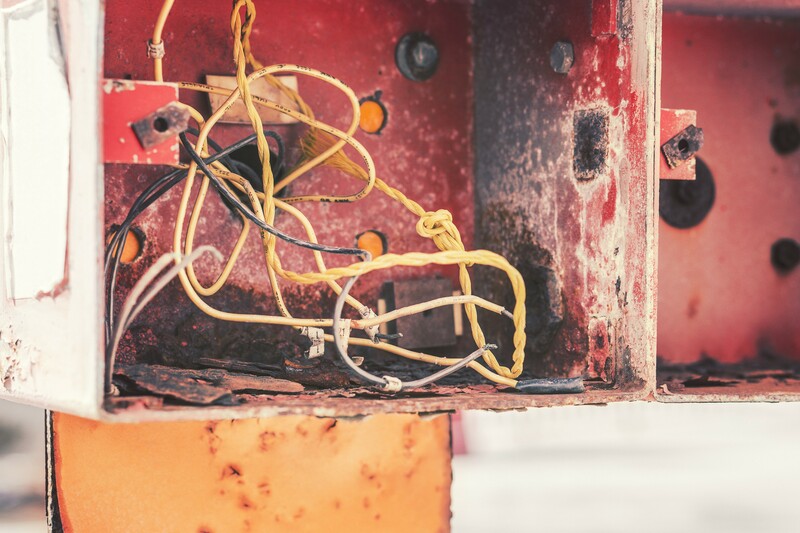 Start a search by setting up a “wire”. This can be by keyword, by location, by list (including pulling in a Twitter list), or a combination of these. 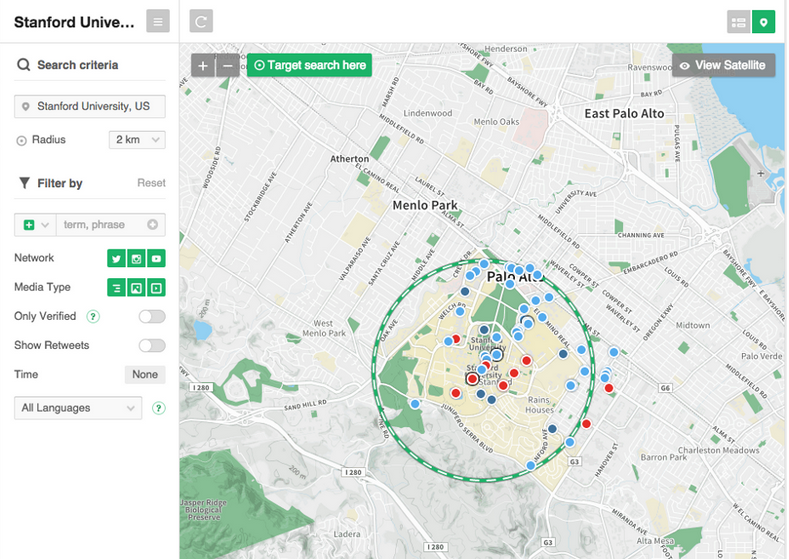 Here’s an example of a location-based search (there is more on finding material from a specific location in the location section of this guide). There’s a time filter, so you can choose the exact time frame you want to explore (within the last seven days). It also allows you to search in multiple languages — including English, Arabic, French, German, Italian, Japanese, Norwegian, Russian and Spanish. It’s designed to help teams collaborate, and includes a feature which to tag content (for example as cleared, or verified), create you own tags or leave a note for others. There is also publishing section to the tool. Just as in Twitter, it’s possible to create lists within Facebook called interest lists. They don’t seem to have caught on much, but are useful, and worth experimenting with. Just as with Twitter lists, you don’t have to follow a page to add it to an interest list, and you can make the list public or private. The lists appear along the left-hand side of your Facebook page. To manage your lists, go to this page, where you can delete a list, add it to your favourites bar etc. Facebook groups have taken off in a big way, and are an excellent way of getting under the skin of what’s happening within a community. The depth of conversation is often much richer than on Twitter. But do be sensitive and ethical in the way you approach Facebook groups as a journalist, and bear in mind that people will often consider themselves to be in a safe space. There are three types of group Facebook— Public, Closed and Secret. To find a group, type what you are looking for in the search bar, hit enter, and then the “groups” tab across the top. This displays all the groups on this topic (other than the ones which are “secret”). If the list is “public” you can view discussion there without being a member, but you need to join if you want to post. If it’s a “closed” group, then you need to ask to join, and be added by the group admin. You can follow YouTube channels by subscribing to them. If you want to get alerts — either by text or email — when an account uploads a new video, then click on the gear icon next to the subscribe button and select “send me notifications”. You can also get there via “subscriptions”, then “manage subscriptions”. IFTTT stands for If This Then That and is a very handy tool. It’s a way of automating the gathering of data, and works with lots of social media platforms, including Twitter, Reddit, Soundcloud, etc. It works using what it calls “recipes”, always based on the “if this then that” principle. You can create your own, or use/amend those created by others. There’s a very handy list of IFTTT recipes for journalists here put together by Abigail Edge.